Could augmented reality help us be better food shoppers? Working out which products to buy when concerned about animal welfare can be a tricky task. Here’s how we’re tackling the problem in Australia with an app we developed, writes our guest author Katinka Day from CHOICE. In Australia and in other countries around the world, many egg brands claim to be “free range” and with labels boasting luscious fields of happy chickens and marketing claims such as ‘organic’, ‘free-to-roam’, or ‘pasture-raised’ – it’s one of the more confusing choices to make in the supermarket. But choosing eggs could soon get a bit easier for Australians. Just a few weeks ago, new free range egg labelling laws came into effect. The new laws mean that eggs can only be classified as ‘free range’ if hens have “meaningful and regular access” to the outdoors where they can roam and forage; and egg producers run a maximum stocking density of 10,000 hens per hectare or one hen per square metre. This is good and bad news. The good news is that new rules require eggs labelled ‘free range’ to display the stocking density (the room hens have to room) on pack. This means shoppers can easily distinguish between eggs that come from hens with lots of room to move from those that don’t. The bad news is that the definition of free range eggs still isn’t strict enough. CHOICE wanted ‘free range’ to meet common sense expectations – meaning that hens actually go outside and have room to move. Even though stocking densities are now listed, the new standard only requires that hens have ‘access’ to the outdoors, rather than actually spending time outdoors. It also allows stocking densities of up to 10,000 hens per hectare. That’s far above the well-accepted 1,500 hens per hectare stocking density set by animal welfare organisations in Australia. While these new laws are an improvement, they might not make buying free range eggs less confusing, especially for people who don’t know what an acceptable stocking density might be. 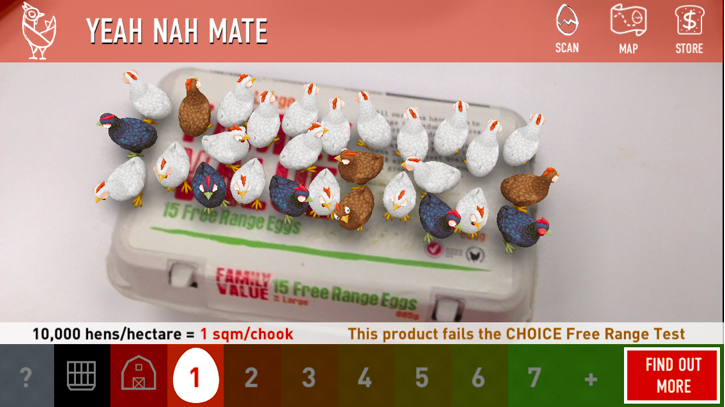 To make buying eggs easier, CHOICE developed a free augmented reality app called CluckAR designed to help shoppers avoid dodgy free range eggs in the supermarket. 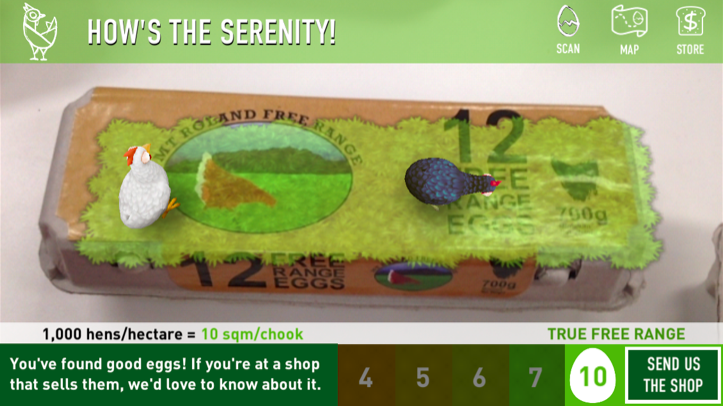 The app lets people scan egg cartons using their phones to determine whether they are really “free range” or not. This allows people to easily distinguish between the good and the bad rather than having to interpret stocking density information themselves. While using an augmented reality app is a bit of fun and helps people navigate the egg market, should we really have to reach to our phones and use apps every time we try and make an informed decision? What are your thoughts? Do you have a hard time trying to find genuine free range eggs in the UK? Would you find a sat-nav useful for your supermarket shop? Trouble is, I became hung up wondering about why the exclamation mark in “How’s the serenity!” wasn’t a question mark and wondering where the comma, ellipses or semicolon should be in “Yeah Nah Mate”. I am keen that the public is made aware of the reality of how their food is produced. No doubt apps, social media and TV coverage of poor practice will help. Most of us, myself included, have little practical experience but it’s worth speaking to those who have. I do like the photos showing the different interpretations of free range eggs. I always buy free range eggs but have no way of knowing what this means. Yesterday I had a long discussion with a chap who had started off as a butcher and moved into the monitoring of the safety and other aspects of meat handling in the UK. He is keen that we should move towards alternatives to meat because the pressure to cut costs means that animal husbandry and what happens after is not as good as we might assume. That’s rather like public perception of free range eggs being laid by hens with freedom to run around fields. Welcome to Which? Convo, Katinka. I hope we will hear more from you and your colleagues at CHOICE. It’s good to have consumers’ associations working together. I have been getting emails from organisation that I am registered with on animal welfare for years , including the one that the government prosecuted the leaders and imprisoned them for breaking into intense production farms and photographing the animals , the pictures were disgusting that so called animal “carers ” and so called “human beings ” could behave in this way for Profit is beyond words . I have zero sympathy for them , lets others defend them I will not Katinka is right – “barn hens ” squashed into barren enclosed spaces , battery hens imprisoned in “Hell ” , hens being de-beaked to stop cannibalism due to lack of protein filled full of anti-antibiotics it just gets worse and yet the general public not knowing or bothering continually visit supermarkets buying the cheapest eggs etc available . Have any of you seen or read the reports on other farm animals ?? I have, all covered up , yes I am a Realist but that doesn’t include accepting inhumanitarian practices for profit . If I tried to post the intimate details I would be censored they are so terrible. The EU egg marketing legislation stipulates that for eggs to be termed ‘free range’, hens must have continuous daytime access to runs which are mainly covered with vegetation and a maximum stocking density of 2,500 birds per hectare. The hen house conditions for free range hens must comply with the regulations for birds kept in barn systems, with a maximum stocking density of 9 hens per square metre of useable area. Hens must be provided with next boxes. Adequate perches, providing 15 centimetres of perch per hen, must also be provided. Litter must be provided, accounting for one-third of the ground surface – this is used for scratching and dust bathing. The Lion Quality Code of Practice stipulates the same additional standards for Lion Quality free range hens as for Lion Quality barn hens plus provision of outdoor shading in absence of a veranda and one pop-hole per 600 birds open for 8 hours daily to allow access to the outside; maximum flock size of 16,000 birds divided into colonies of 4,000 where flock size is over 6,000 birds in total; a maximum stocking density of 2,000 birds per hectare. The width and height of the popholes is greater than required by EU legislation.“. The stocking density is only just above the animal welfare’s recommendation in Australia. I don’t know if Which? has carried out a similar investigation and I could only find an eleven year old report on the website. Which? has reported about food fraud but perhaps we need some information about ethics. We need to know which companies are good eggs, augmented reality or not. As Katinka has pointed out some free range eggs are produced under conditions with high stocking levels. I would like to know what I was buying. This is not easy to obtain Wavechange but I will persevere as the old Indian Chief once said when ordered to conform by the then President of the USA. locations -IE- a Welsh village has intensive cow farming -1000 cows but names are not forthcoming. Katrinka refers only to Australia, presumably. I would like animal husbandry regulations to be established in the UK that are acceptably good, that producers are monitored against them and products labelled accordingly, including those imported. I have no expertise to assess whether a stocking rate or other criteria is good so can only, if I choose, compare it with an established standard. It seems from what I found that British Lion eggs that are free range should come from compliant producers. Is there sound evidence to the contrary? Malcolm – Production of free range eggs in the UK now represents about half of those sold and from looking at what is on sale in supermarkets: https://assets.publishing.service.gov.uk/government/uploads/system/uploads/attachment_data/file/704779/eggs-statsnotice-3may18b.pdf The growth in intensive production (see my reply to Duncan, above) suggests that there is likely to be a focus on meeting the current UK requirement for Lion branding, which is hardly impressive in my view. Last time I looked Wavechange it was -43 % free range / approx 50 % intensive and the rest barn/ etc. I will keep checking on this issue. I expect that the percentage of free range eggs sold (rather than used for catering, ready meals, etc) is higher because it has been a good selling point. Unfortunately standards are minimum standards and if we had access to information about how our food was produced at least some of us would be selective about what we bought. One of the links provided by Katinka explains that effectively the standards have been reduced in Australia, but at least the stocking density appear to be accessible to the public. Most standards are “minimum” meaning criteria that you must equal or exceed. I don’t know how many people shopping for free range eggs would have a clue about what stocking density to accept. Many probably won’t know what a hectare is (2.471 acres, 10000m² – and I do not mean this to sound disparaging). A standard that is accepted is what most concerned people will want to see met (in my view, anyway). So if the British Lion standard for free range eggs is a reasonable standard then the simple way is to buy eggs marked accordingly. Hopefully the standard will be policed. One of the major problems with standards fraud is if we do not have means to check against them – we need a proper Trading Standards to deal with that, and we haven’t. Back to reputable retailers. If people are sufficiently concerned about animal welfare then buying free range eggs will be the choice over barn reared. There is no need for the public to understand what a hectare is, though it is easy to find out. Most people are aware of intensive farming and the photos in the introduction provide a simple visual indication that no-one could fail to understand. Rather than waiting for Trading Standards to deal with problems, I think it is better to set standards based on our understanding of animal welfare and carry out independent assessment to endure that the law is being complied with. The Lion code refers to stocking densities in the UK. Free-range flocks are when you let your flock range rather than keep them in a building. – You must make sure that your flock has continuous daytime access to open runs (mostly covered with vegetation). Runs should have a maximum stocking density of 2,500 birds per hectare. Until I hear of compelling evidence to the contrary I’ll continue to buy free range eggs from a reputable retailer. These are recommendations – a code of practice. I favour legislation. Several days ago I met a former butcher who whose more recent experience is environmental health and accreditation schemes in the meat industry. He is appalled by what goes on nowadays and the public knows nothing about. On another matter he reminded me that meat can be imported and legally branded as UK produced. He gave me the examples of Romania and Yorkshire. My friend who works in policing under the Red Tractor scheme confirmed this and since then I have met someone who actually worked in a plant where imported eggs were sold as UK produce. The problem with legislation is how it gets watered down by vested interests, and the farming community has huge influence. It would currently have to be done by the EC as we are part of Europe. Another problem is how it is properly policed – the problem with all legislation. Maybe in an ideal world where only people with knowledge and integrity were responsible for it. Many eggs are imported and I don’t know how you properly police that, least of all with liquid egg. I presume the British Lion code is a sensible one and if it is properly observed and monitored should yield a decent standard of welfare. We need to be encouraged to only buy such eggs. If major retailers publicise their policy on the production of eggs they sell then I’ll stick with one of those (unless I find otherwise). 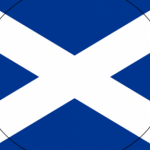 They have the resources to ensure that where they purchase from will comply with their own standards. duncan, nothing worse than a very liquid spready egg. If they were not out of date (old eggs, I believe, do this) and it was not a one off, I’d buy your eggs elsewhere. May cost a bit more – ours cost £1.33 for 10 – but I think they are still good value. I’d be more concerned at present with dealing with the battery production of eggs and poultry meat. This seems to be what has happened in Australia, Malcolm: https://www.choice.com.au/food-and-drink/meat-fish-and-eggs/eggs/articles/egg-standard-260417 Presumably the industry has applied pressure on the government to allow lowering of the minimum standard or whatever you would prefer to call it. Could the same happen in the UK? I hope not, but perhaps we should push for information about stocking density for the stocking densities used for eggs sold by the large supermarkets. I wonder if Which? could provide us with any information. I realise that we are probably being expected to discuss the virtues of augmented reality to help engage with the public. We had a society event yesterday and visitors had the opportunity to experience virtual reality at its simplest, using headsets including a mobile phone. I suggested using swivel chairs next time to encourage viewers to turn round and look at what’s going on behind them. It’s worth experiencing what innovations in technology have achieved. I’m not sure what augmented reality is in the context of free range eggs. Is it “information”? I haven’t the time to check all appropriate products in a supermarket with a mobile phone before I decide to buy. I’d rely on the retailer’s standards. The British Lion scheme gives stocking density. I gave a link earlier.”a maximum stocking density of 2,000 birds per hectare.“. 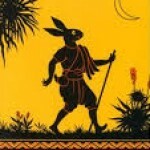 Katinka has outlined how it works and there is other information online. At least Australia seems to have publicly available information about stocking densities so if we are interested we can use an app in the shop or maybe check on a website. I used to think that phone apps were of limited use but soon learned that the phone is analogous to a workshop and the apps are the tools we choose to use. Maybe we could find a suitable Convo to discuss this, Malcolm. I would like to speak to people with some involvement first. They didn’t generate a lot of interest at the time. It’s incredible that we are talking about varying degrees of cruelty acceptablibility depending on our individual views (or budget, let’s never lose sight of that). We shouldn’t need an app or anything else, there shouldn’t be mistreated hens at all in the first place. I agree Sophie. However, we are where we are and I think the public needs to learn more about how our food is produced and hopefully more of us will push for higher standards and certainly oppose moves that could allow them to be reduced. A few years back the Food Standards Agency shamed the supermarkets because they were selling chicken that was so contaminated with campylobacter (the most common food poisoning bug) that the public was advised not to eat raw meat. With most retailers this has resulted in a significant improvement that might not have happened without this intervention. Unfortunately the companies are now largely self-policing the problem and I wonder how much progress will be made. “the public was advised not to eat raw meat. Presume you meant undercooked meat? From as long as i can remember I have been advised to ensure poultry (and pork) were thoroughly cooked before eating, and raw meat was not stored where it could contaminate cooked meat or other food. Proper cooking kills campylobacter. Some often condemn companies as incapable of acting with integrity, where it seems the norm to assume all profit making enterprises are wicked villains 🙂 It is certainly easier to draw attention to a deficiency, rather than when a company behaves normally or better. I do the same with Which? I have added a correction, thanks Malcolm. On the basis that all the supermarkets and other retailers were selling raw chicken that was heavily contaminated (>1000 cfg/g) and that following press publicity, standards have shown improvement (but not enough) I do believe that companies are not capable of self-policing. I’m looking at facts and not using ‘wicked villains’ or other emotive terms. This page has a video showing undercover investigation in processing plants that supply chicken for retailers: https://www.theguardian.com/world/2014/nov/27/dirty-chicken-scandal-campylobacter-eight-out-10-uk-birds-supermarkets-asda Subsequent to release of this video, contamination figures were released for most supermarkets. We have plenty of other Conversations to discuss the continuing campylobacter problem. The investigation is 4 years old. Perhaps more relevant to eggs is salmonella. Since its formation in 1986, the British Egg Industry Council has been committed to representing the UK egg industry on matters ranging from breeding, hatching and rearing of hens, to egg production, packing, processing and marketing. The BEIC’s prime objective is to act as a voice for its members, representing their interests and expressing their concerns in discussions with Government, the European Commission, European Parliament and other important bodies. Composed of 11 major industry trade associations, the BEIC is primarily funded by voluntary levies from those within the industry that together produce around 90% of the UK’s eggs. 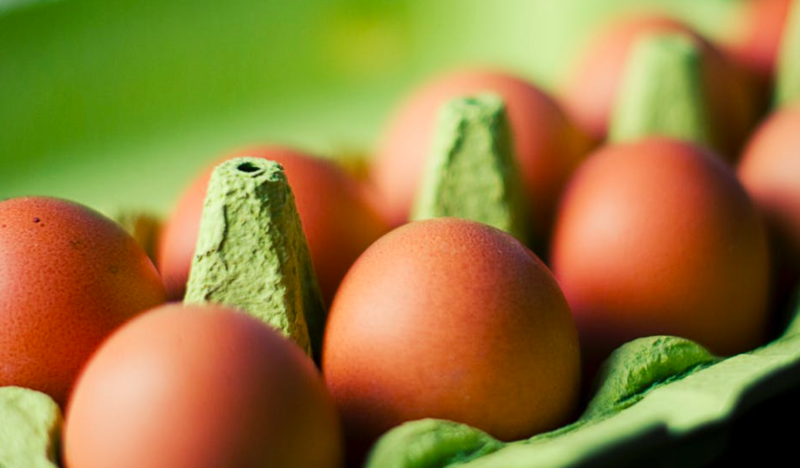 The BEIC is further responsible for the formation and running of the British Egg Information Service to provide the public with information concerning egg recipes, egg nutrition, egg safety and egg production. By subscribing to and supporting the British Egg Industry Council, its subscribers adhere to the Lion Code of Practice, a system which maintains the highest standards of egg safety and egg production throughout the UK. Since its introduction in 1998 the British Lion scheme has effectively eradicated Salmonella in British eggs by implementing a series of stringent standards across the egg production chain. The UK egg industry has invested £100 million into the scheme, and now maintains a level of food safety that goes above and beyond the required target outlined in current UK and EU legislation. The recommendation to avoid eating runny eggs was thanks to Edwina Currie who was heavily criticised for warning the public of the small risk to certain members of the public. This led to the vaccination of birds to largely eliminate the risk. I admire M&S for publishing their own results. The average among producers was 20.1% in 2014, when M&S was half that. And their other degrees seem to be also reduced. It is a difficult bacterium to deal with. Ideas to do so? I could buy deep frozen, chlorinated in future, but I’d prefer to take chicken from a decent retailer and stick to the long-standing advice to cook it properly. Meanwhile supermarket “interventions” are still ongoing and hopefully will reduce the natural organism still further. Perhaps we should return to eggs, the subject of this topic? I believe that retailers are obliged to publish data. If there is any new information, we can discuss it in a relevant Convo. You are an expert witness in the field of biological contamination, are you not, Wavechange? As far as the methodology for measurement of contamination goes then yes, it’s simple. What I’m not sure about is the practicality of producing chicken free from high level contamination with campylobacter and the extent to which intensive farming and processing are factors. My impression is that everything gets covered in faeces and some of this remains at the point of sale. Looking at your recent comments in another Convo I’m very glad that we agree on independent assessment. It’s only internationally recognised I suppose.